Extract Email Addresses for Excel extracts email addresses found in a single workbook or multiple Excel workbooks. The email extraction provides an efficient way to create email lists for sales and marketing purposes from complex and disbursed Excel file structures. Ability to search Excel files recursively for email addresses. Option to search Excel files in sub folders. Option to ignore duplicate email addresses in order to create a list of unique email addresses only. Ability to specify file type by extension (XLSX, XLS, etc). 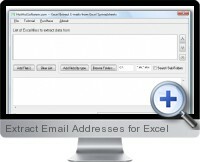 Extract Email Addresses for Excel is compatible with files created with Excel 2000 or higher.